The XXIII Congress of Ukrainian Canadians themed “Honouring the Past, Inspiring the Future” concluded with a strong mandate for the term 2010-2013 to: engage Ukraine, support enhanced youth engagement and leadership training for community organizations; and to finds ways to connect the 1.2M Ukrainian Canadians through initiatives such as the arts and social media. “The Congress has provided a strong mandate for the community to speak with one voice through the Ukrainian Canadian Congress,” stated re-elected National President Paul Grod. “At a time when we are marking momentous occasions such as the 70th anniversary of the Congress and looking at the 120th anniversary of Ukrainian settlement of Canada, the Congress will be working with our member organizations to coordinate initiatives across Canada to celebrate this important year. Held in Edmonton for the first time, the Congress attracted nearly 300 registered delegates from across Canada representing every aspect of community life. The resolutions adopted by the congress included a reaffirmation of the need for an enhanced presence in Ottawa through an information and resource center; a declaration that we must shift our focus towards community development through capacity building and leadership training as well as a strong commitment to our heritage through promotion of Ukrainian culture, the Arts and language education. A complete list of Congress resolutions adopted is posted on our website at www.ucc.ca. 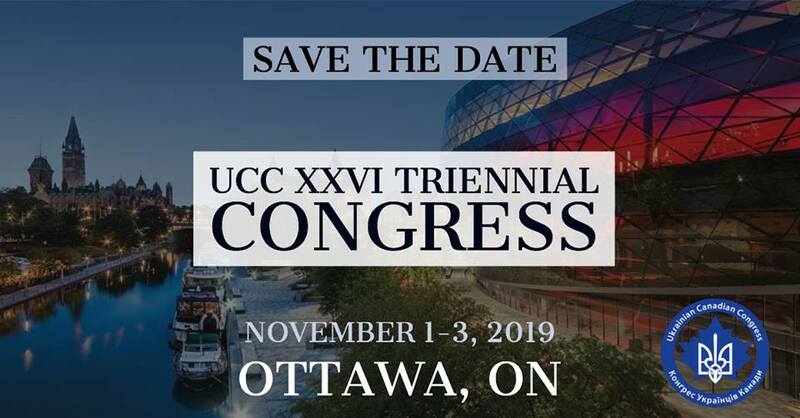 The UCC would like to thank the following key note speakers Dr. Olenka Bilash, The Honourable Gene Zwozdesky, MLA, Mr. James Temerty, Volodymyr Viatrovych, Dr. Lubomyr Luciuk and the Hon. Rob Merrifield, M.P.